This week, Rupert Murdoch's "The Australian" dutifully reported as news an opinion piece, from 16 denier–scientists, claiming that the world had stopped warming, which had originally been published in Murdoch's Wall Street Journal as No Need to Panic About Global Warming: There's no compelling scientific argument for drastic action to 'decarbonize' the world's economy. Stopped warming! 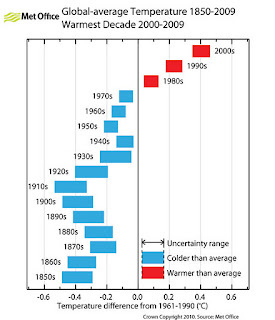 Our one-graphic response (above) to this absurdity is this chart from the UK Met office. Many have responded to the WSJ story, including Graham Readfearn in Crikey, Climate Progress in In Must-Read WSJ Letter, 3 Dozen Top Climate Scientists Slam Murdoch’s 16 Posers: “Dentists Practicing Cardiology”, and Peter Gleick at Forbes with Remarkable Editorial Bias on Climate Science at the Wall Street Journal. And the Daily Climate reports that half the authors of the Wall Street Journal opinion piece denying the Earth's warming trend have ties to the oil and gas industry. Here is the ANU's Andrew Glikson's take on their scientific claims , a cross-post from The Conversation. On Friday, the Wall Street Journal published a letter from “16 concerned scientists”, telling the world we don’t need to worry so much about climate change. Unsurprisingly, the opinion piece has been picked up by outlets worldwide, including The Australian. 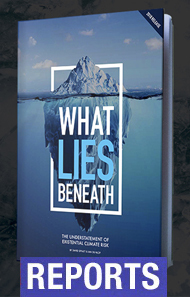 In their article the authors claim the reason for their doubt about the reality of climate change is “a collection of stubborn scientific facts”. My response below relates purely to scientific points. Let us look at the facts. The authors open by stating, “Perhaps the most inconvenient fact is the lack of global warming for well over 10 years now". However, this is not the case. 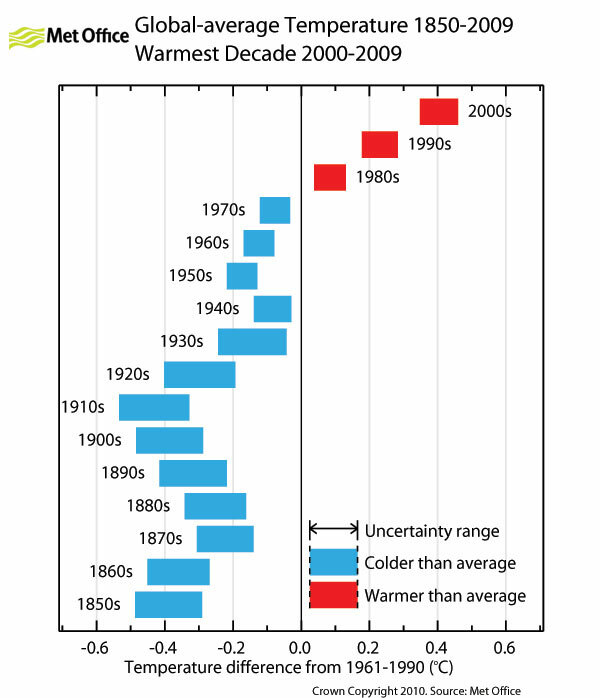 According to NASA/GISS, the first decade of the 21st century has been the warmest on the instrumental record. Global surface temperatures in 2010 (and similar in 2005) have been the warmest on the instrumental record. 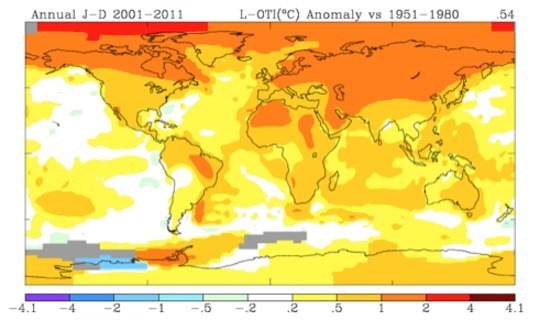 From January to October 2010, global land and ocean surface temperature were significantly higher than the 20th century average of 14.1°C (see figures 1 and 2). It is a “straw man argument” to assume global warming is a uniform process. Natural variability induced by the ENSO cycle and the 11 years sun spot cycle, superimposed on the greenhouse warming trend, results in transient reversals of warming. Paleo-climate studies indicate that past warming trends – such as the the Younger dryas and the 8.2 kyr event – were associated with transient cold phases due to the regional effects of ice melt water, mainly in the North Atlantic. 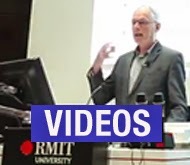 The authors talk about “the smaller-than-predicted warming over the 22 years since the UN’s Intergovernmental Panel on Climate Change (IPCC)”. It is not clear which particular IPCC prediction the authors refer to. 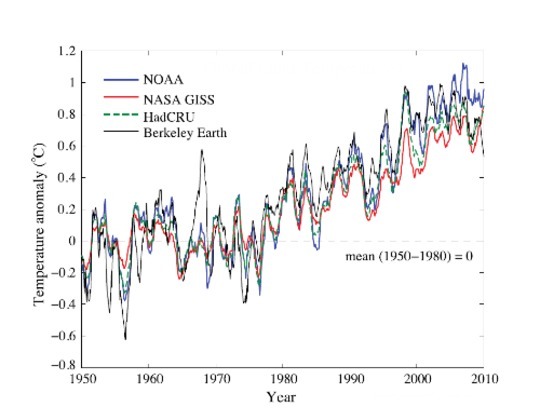 The Third Assessment Report (2001) projects mean global temperature rise in mainly in the range of 0.5-0.8C above 1950-70. According to NASA/GISS, the National Climatic Data Center and the Hadley Climatic Research Unit, the rate of warming during 1975-2010 (+0.5 to +0.6C, 0.014 to 0.017C/year) has been one to two orders of magnitude faster than the rates of temperature rise during the ends of previous ice ages. An independent study of global temperature data from 1880AD onward by the Berkeley Group concluded “Our biggest surprise was that the new results agreed so closely with the warming values published previously”. Following the emission of more than 350 billion tonnes of carbon dioxide since 1750AD (more than half the original atmospheric carbon inventory of 590 billion tonnes), the growth rate of atmospheric CO₂ has reached about and over 2 ppm/year. This is a rate unprecedented in geological history, bar during times of mass extinction of species related to global volcanism and asteroid impacts. Comprehensive paleo-climate studies establish atmospheric CO₂ levels of 500+/-50 ppm as the approximate upper stability limit of the Antarctic ice sheet (although some studies suggest values of ~600 or 800 ppm). The current level of 392 ppm is similar to late Pliocene level of ~400 ppm, when temperatures were ~2°C to 3°C higher than present and sea levels were 25 metres (+/-12m) higher than present. CO₂ levels higher than 350ppm are considered by Hansen and others to be dangerously high. The authors say “those promoting alarm have shifted their drumbeat from warming to weather extremes”. Those concerned about climate change have always been concerned with weather extremes. Extreme weather events are expected from heat waves and, as sea temperatures rise, from floods and storms. 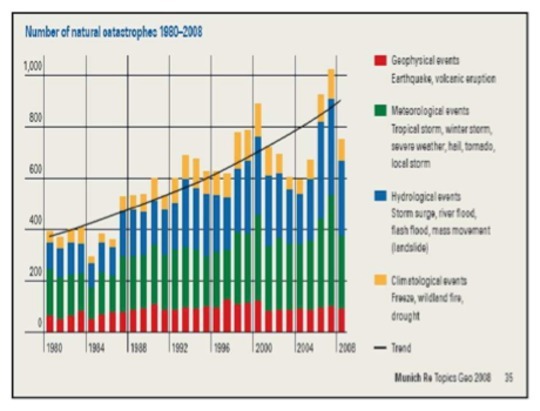 These events have doubled in frequency during 1998-2008 as documented by Munich Re-Insurance (see Figure 3). The authors claim “… CO₂ is not a pollutant. CO₂ is a colorless and odorless gas, exhaled at high concentrations by each of us, and a key component of the biosphere’s life cycle.”This statement reflects a misconception regarding the physiological and biological effects of changing concentrations of elements such as carbon, oxygen, sulfur or phosphorous. A corollary would be the human lungs: a small increase in CO₂ can lead to hypercapnia; a rise in oxygen beyond critical thresholds result in oxygen toxicity. Improvements in plant photosynthesis do not depend exclusively on availability of CO₂ but on the availability of water and on temperatures. The intensification of the hydrological cycle associated with global warming, resulting in floods in some regions and in droughts in other, is hardly conducive for agriculture. The evolution of plants and animals occurred over millions of years, when species had time to evolve and adapt to changing atmosphere and hydrosphere conditions. 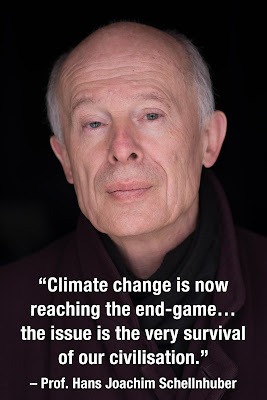 When changes occur at rates to which plants and animals cannot adapt, such as the current rate of 2 ppm CO₂/year, unprecedented in geological history, mass extinction of species becomes a reality.